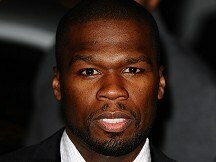 Rapper 50 Cent is working on a novel with an anti-bullying message. The Penguin Young Reader Group has signed up 50 Cent's novel Playground, the publisher has announced. The book is described as a semi-autobiographical young adult novel about bullying that will come out in January 2012. The 34-year-old rapper, whose real name is Curtis Jackson, has acknowledged a violent childhood and dealing drugs at an early age. He's also released a memoir, From Pieces To Weight, and a self-help guide co-authored by Robert Greene called The 50th Law. Cee Lo Green has insisted he is not homophobic, but refused to apologise for remarks he made on Twitter suggesting a critic was gay. Amy Winehouse is axeing all scheduled shows and will be given "as long as it takes" to sort herself out. Sean Kingston has said he's feeling better almost a month after crashing his watercraft into a bridge. Popstar To Operastar's Joseph Washbourn has assured fans he will not break out into operatic spurts during his band Toploader's live shows. Rapper 50 Cent is working on a novel with an anti-bullying message.The Penguin Young Reader Group has signed up 50 Cent's novel Playground, the publisher has announced. Robbie Williams reportedly gave thousands of screaming fans more of a show than he meant to when he accidentally flashed during a concert. Bob Dylan wowed the crowds who braved the rain to see him perform at the London Feis Festival this weekend, performing a string of his classic songs. Beyonce Knowles, Russell Brand, David Duchovny and King's Speech director Tom Hooper have been invited to join the Academy of Motion Picture Arts and Sciences. Glastonbury revellers may have an extra incentive to elbow their way closer to the stages - it may help charge their phones.